“In 1961, the first Smoker Craft boat was launched,…” Smoker Craft of New Paris, Indiana, is celebrating over fifty years of family-based boat building in 2015. The Smoker Craft family includes such well known boat brands as Starcraft, Sylvan, SunChaser, and more. 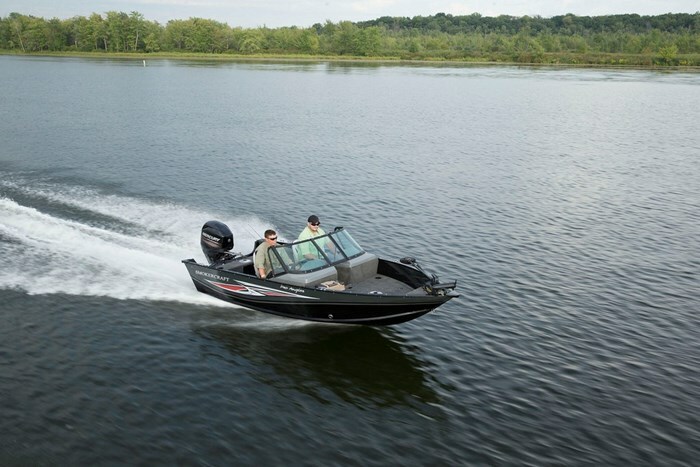 The dual-console 162 Pro Angler with its tall, full walk-thru curved windshield is exactly sixteen feet length overall with a six foot, nine inch beam at its widest point tapering back to six feet two inches at the transom. It features a .100” gauge one-piece aluminum hull bottom with three keels and with .064” gauge in the sides and with a 10° deadrise semi-vee design. Weighing in at 900 pounds for the boat only, it has a rated capacity for five persons and a sixty horsepower outboard of the brand of your choice. Five seat bases within the 162 Pro Angler are standard, one each at the driver and passenger helm, one behind the passenger helm in the cockpit, and one each on the bow and stern casting platforms. Two composite constructed fishing seats with movable pedestals come standard. The driver’s seat has an adjustable slider. 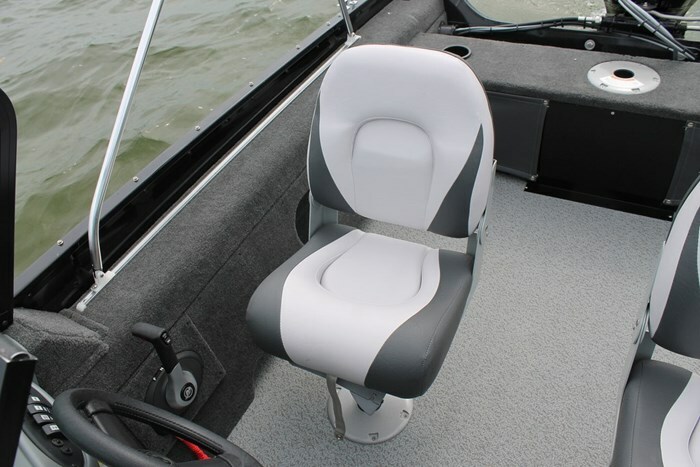 Additional fishing seats are optionally available. Vinyl is the standard covering for the cockpit with 18 ounce carpet covering both the bow and stern casting platforms. Snap-in carpet is optionally available for the cockpit floor. 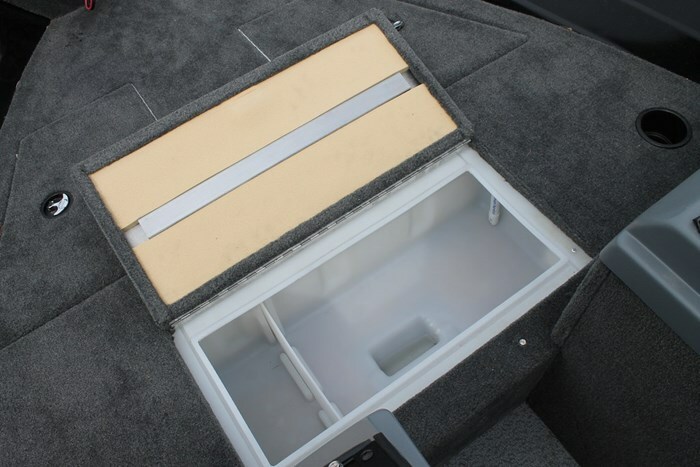 For a sixteen foot boat, you will find lots of dedicated and covered storage compartments. Port and starboard hinged-lid storage is found within the bow casting platform with open-access covered storage under the bow trolling motor raised platform plus under the starboard side gunnel behind the helm seat. There is more storage beneath the stern casting platform plus a glove box in the passenger helm and a lockable rod storage compartment within the port side gunnel suitable for up to six foot rods. 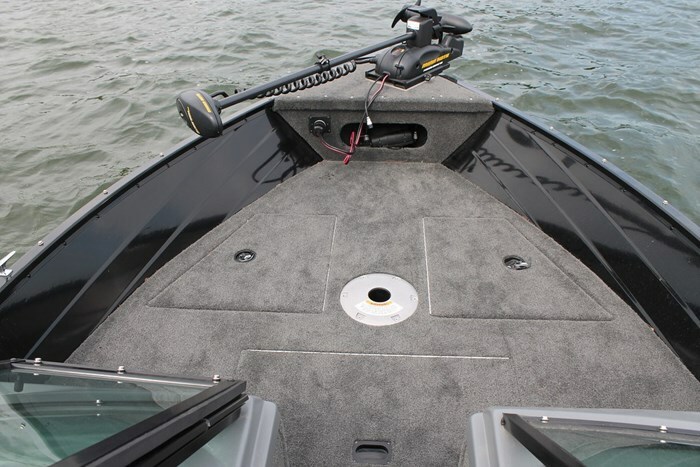 Just forward of the centre opening windshield in the step up to the bow casting platform is a standard, built-in, hinged-lid, 25-gallon aerated, timed, and compartmentalized livewell. The attractively molded and tiered driver’s helm features standard tachometer, speedometer, and fuel gauge plus lighted DC rocker switches. 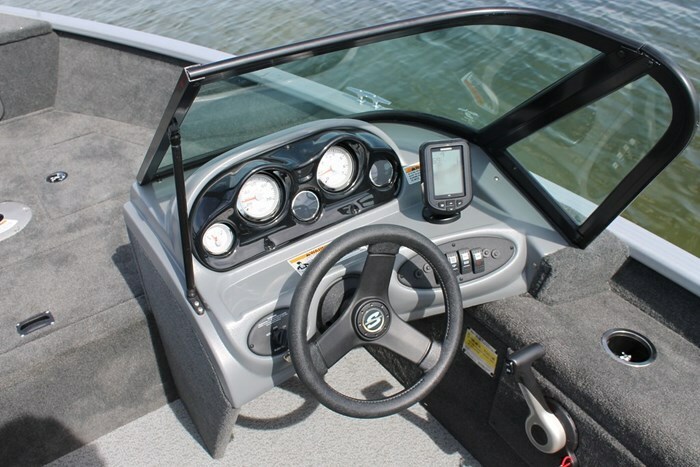 An optional in-dash digital depth gauge is available as is a graph-type sonar/fish finder with a dedicated flat area to the right of the steering wheel intended for mounting it. Twice-baked urethane paint on the hull sides in black with either red or blue decal is standard as is a trolling motor plug. Notable optional equipment includes lots of canvas possibilities to satisfy our Canadian needs for weather protection especially in our spring and fall prime fishing seasons. 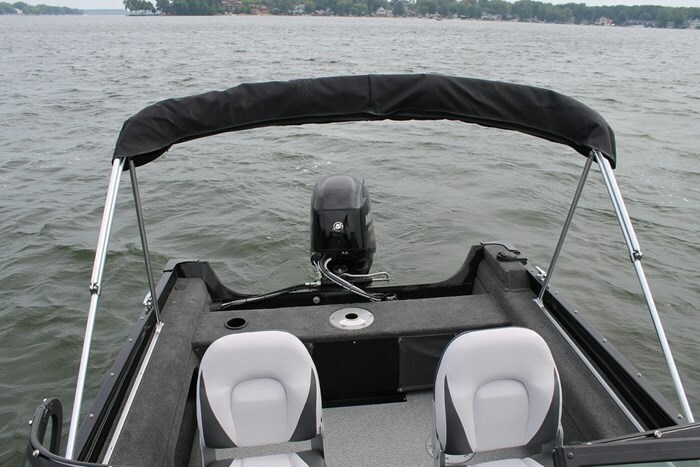 These options include a bow cover, cockpit cover, a fisherman’s top with or without side and aft curtains plus walk-thru curtains for added protection against the cool wind when underway. An optional AM/FM stereo with MP3 port will provide on-board entertainment and a stern platform with two-step boarding ladder will provide easier water access. Also available is a battery charger, trolling motor with quick disconnect, and hydraulic and tilt steering. A split flip-up stern bench seat is available to provide additional passenger seating. The Smoker Craft 162 Pro Angler makes it easy for you to get out and enjoy your favourite sport or pastime of fishing.